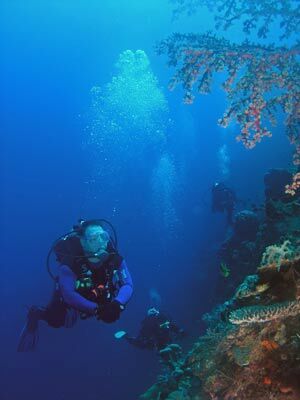 This dive is located off the western side of Pulau Moyo (Moyo Island) in the Bali Sea. An approximate GPS mark for the dive spot is 8° 13' 43.3"S 117° 28' 39.8"E (using WGS84 as the datum). The site is located about 500 metres to the south-west of the GPS mark. 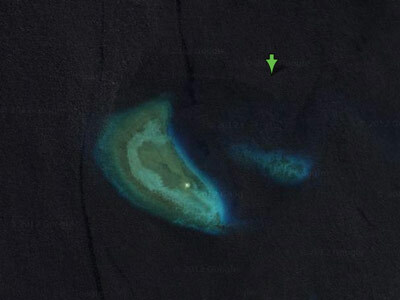 The actual site is a sand cay (island) that just clears the surface of the water. 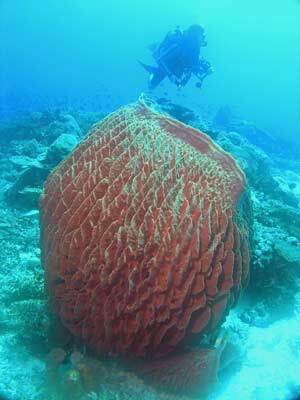 The top of the reef is relatively flat, about 10 metres for most of it. On the western and southern sides the sand drops down from 10 metres quite steeply. The northern and eastern sides slope more gradually. As with virtually all dive sites that you do when on MV Mermaid II, you use the RIB (rigid inflatable boat) to get to the start of the dive (and also to get back to the boat). The RIB will drop you normally upstream of the current. We were dropped on the south-western corner of the site near the top of the wall and descended straight to about 24 metres. 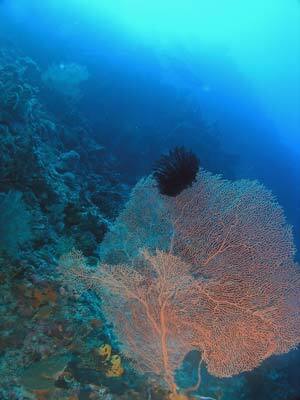 The wall here is vertical, with lots of large gorgonias and barrel sponges. We drifted to the east with the slight current (you could easily swim against it). I went down to about 36 metres, but the bottom here is at least 50 metres. Deeper there were some much large gorgonias and the colour was brilliant. The reef had lots of the normal tropical species, clownfish, large pufferfish and the scribbled filefish or leatherjacket. There were also lots of surgeonfish and different wrasse and triggerfish. 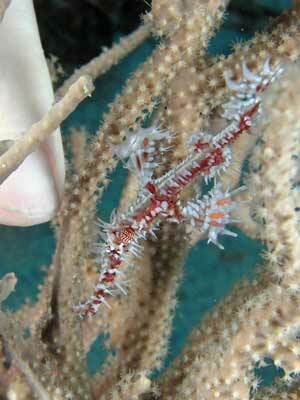 Many of the barrel sponges had hairy squat lobsters in the folds of the barrels. This are a pink colour and very beautiful, although they can be hard to photograph. We continued drifting with the current and gradually ascending so as to stay outside decompression limits. 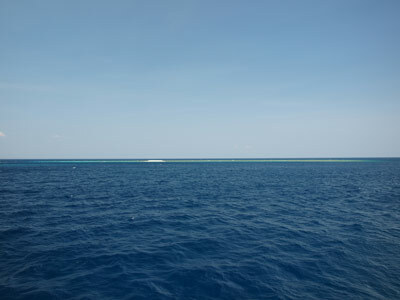 After about 20 minutes, the reef turns to the north and we soon after this the wall becomes a slope. This is more sandy and has isolated outcrops of coral. The depth has come up to about 18 metres and gradually gets shallower. There are still lots of gorgonias in this area, but they are smaller. 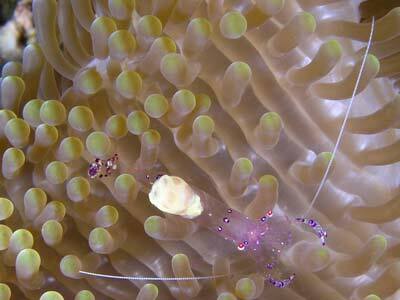 There are also many sea whips and lots of anemones with clownfish. In some we find glass shrimp. On the sand in the 10 metre area there are hundreds of garden eels, perhaps one of the hardest of fish to get a good photograph of as they duck back into the sand as soon as you get close. We spend the last part of the dive in this area before ascending. We have to do our safety stop in blue water as there was no reef shallower than about 9 metres in this area. Our dive guide sent up a safety sausage (and I think Kelly also practised sending hers up) and after a stop of about 8 minutes we surfaced and were collected quickly by the RIB. This was an excellent first dive, perhaps with not as much of the exciting things that we would see later in the trip. 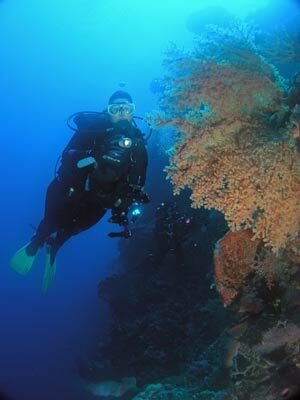 The visibility was probably 40 metres and the water temperature was about 27�C. Click here to return to see the dive profile from my computer. Following is a video Kelly shot on our trip. 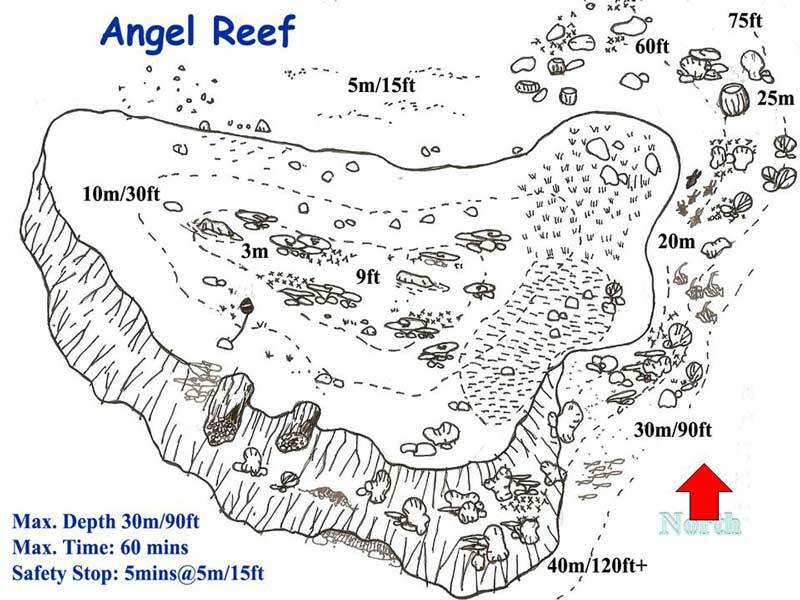 Located right near here was Little Angel Reef which we did as the last dive of the trip on the way back from Komodo. It was also an excellent dive site. Click here to read about that site .